Most guidelines recommend including these medications as part of the care plan for AD patients with no contraindications as long as the patient and his or her caregivers are carefully educated on the medications’ risks and benefits and the appropriateness of their use remains under evaluation. Patients and families should be educated on expected benefits associated with using these medications with realistic therapy goals in mind. CIs improve memory and cognitive function by increasing the availability of acetylcholine in the central nervous system by blocking the degradation of acetylcholine by the enzyme acetylcholinesterase. CI selection often is based on a particular medication’s side effect profile. The most common side effects with CIs are nausea, vomiting, diarrhea, weight loss, and loss of appetite.2 These side effects typically are transient and may be minimized by slowly increasing the dose. Because CIs can cause syncope, patients should be monitored for risk of falls. Namenda XR, a once-a-day extended-release capsule form of memantine, is currently being marketed. The capsules can be given with or without food and can be taken intact or opened and sprinkled on applesauce. CIs and NMDAs are most effective when started early in the disease course and used persistently without treatment gaps. Therefore, early recognition of AD and evaluation of treatment effectiveness are essential.10 Early treatment provides the opportunity to attain maximum benefits during AD’s early and later stages.11 Aggressive treatment may maximize patient function and independence. Doses should be increased to the maximum tolerated amount to increase the potential for efficacy. Clinicians often struggle with when to discontinue AD medications. Before discontinuing, clinicians must consider that losses in cognition that occur following discontinuation of six weeks or longer may not be reversed when therapy is reinstated. These medications often are discontinued when patients are admitted to the hospital, and failure to restart these medications on discharge can have tremendous negative implications for these patients. • deteriorates to the point of having no meaningful social interactions or quality of life as determined by caregivers and health care providers. Coconut oil and a related medical food, Axona, are being promoted as AD treatments, and their use has gained significant media visibility. Advocates describe AD as “diabetes of the brain” and believe the brain utilizes the ketones provided by coconut oil better than glucose, therefore improving cognitive function. Other theories suggest these ketones help prevent amyloid plaques and reduce the inflammatory responses associated with neurodegeneration. Still others speculate that ketones may improve free radical-mediated pathologies associated with AD. The University of South Florida Health Byrd Alzheimer’s Institute has announced a pilot study beginning this year to evaluate the potential benefits of coconut oil for mild to moderate AD, which may help improve ketones’ credibility and recognition as a possible AD treatment. Without additional clinical research, it is difficult to recommend coconut oil at this time for AD treatment. However, as seen with traditional treatments, therapies’ effectiveness and benefits often vary among patients. AD patients and their families who choose to use coconut oil or Axona should start with low doses and gradually increase to avoid adverse gastrointestinal effects. It also is important that a patient’s health care provider is made aware of the use of these treatments to help monitor for adverse effects and effectiveness and possibly increased lipid levels. 1. Thies W, Bleiler L; Alzheimer’s Association. 2013 Alzheimer’s disease facts and figures. Alzheimers Dement. 2013;9(2):208-245. 2. Alzheimer’s Disease medications fact sheet. National Institute on Aging website. 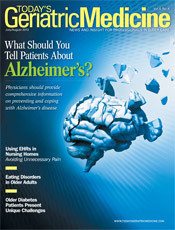 http://www.nia.nih.gov/alzheimers/publication/alzheimers-disease-medications-fact-sheet. Last updated May 21, 2013. Accessed May 11, 2013. 3. Rodda J, Morgan S, Walker Z. Are cholinesterase inhibitors effective in the management of the behavioral and psychological symptoms of dementia in Alzheimer’s disease? A systematic review of randomized, placebo-controlled trials of donepezil, rivastigmine and galantamine. Int Psychogeriatr. 2009;21(5):813-824. 4. Crowell TA, Paramadevan J, Abdullah L, Mullan M. Beneficial effect of cholinesterase inhibitor medications on recognition memory performance in mild to moderate Alzheimer’s disease: preliminary findings. J Geriatr Psychiatry Neurol. 2006;19(1):13-15. 5. Asp E, Cloutier F, Fay S, et al. Verbal repetition in patients with Alzheimer’s disease who receive donepezil. Int J Geriatr Psychiatry. 2006;21(5):426-431. 6. Rockwood K, Fay S, Jarrett P, Asp E. Effect of galantamine on verbal repetition in AD: a secondary analysis of the VISTA trial. Neurology. 2007;68(14):1116-1121. 7. Kwak YT, Han IW, Suk SH, Koo MS. Two cases of discontinuation syndrome following cessation of memantine. Geriatr Gerontol Int. 2009;9(2):203-205. 8. Namenda XR. Drugs.com website. http://www.drugs.com/pro/namenda-xr.html. Last updated April 2013. 9. Namenda tablets/oral solution. Forest Pharmaceuticals website. http://www.frx.com/pi/Namenda_pi.pdf. Accessed May 15, 2013. 10. Seltzer B. Cholinesterase inhibitors in the clinical management of Alzheimer’s disease: importance of early and persistent treatment. J Int Med Res. 2006;34(4):339-347. 11. Homma A, Imai Y, Tago H. Long-term safety and efficacy of donepezil in patients with severe Alzheimer’s disease: results from a 52-week, open-label, multicenter, extension study in Japan. Dement Geriatr Cogn Disord. 2009;27(3):232-239. 12. Doraiswamy PM, Krishnan KR, Anand R, et al. Long-term effects of rivastigmine in moderately severe Alzheimer’s disease: does early initiation of therapy offer sustained benefits? Prog Neuropsychopharmacol Biol Psychiatry. 2002;26(4):705-712. 13. Geldmacher DS, Provenzano G, McRae T, Mastey V, Ieni JR. Donepezil is associated with delayed nursing home placement in patients with Alzheimer’s disease. J Am Geriatr Soc. 2003;51(7):937-944. 14. Lopez OL, Becker JT, Wahed AS, et al. Long-term effects of the concomitant use of memantine with cholinesterase inhibition in Alzheimer disease. J Neurol Neurosurg Psychiatry. 2009;80(6):600-607. 15. Rive B, Vercelletto M, Damier FD, Cochran J, Francois C. Memantine enhances autonomy in moderate to severe Alzheimer’s disease. Int J Geriatr Psychiatry. 2004;19(5):458-464. 16. Atri A, Shaughnessy LW, Locascio JJ, Growdon JH. Long-term course and effectiveness of combination therapy in Alzheimer disease. Alzheimer Dis Assoc Disord. 2008;22(3):209-221. 17. Gauthier S, Wirth Y, Möbius HJ. Effects of memantine on behavioural symptoms in Alzheimer’s disease patients: an analysis of the neuropsychiatric inventory (NPI) data of two randomized, controlled studies. Int J Geriatr Psychiatry. 2005;20(5):459-464.